What a year for the LKC! Doddridge County girls cross country captured the first Class A title in the history of the Mountain State Oct. 29 at Cabell Midland. 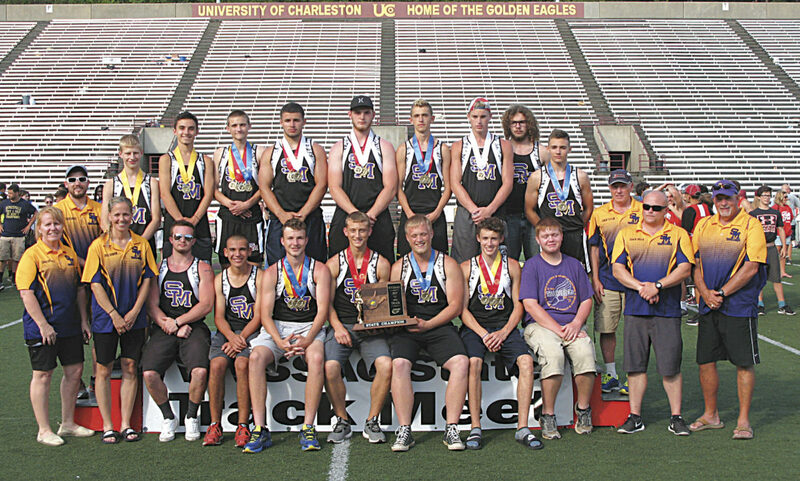 The St. Marys boys track and field team captured the team state title on the last event May 19 at Laidley Field. 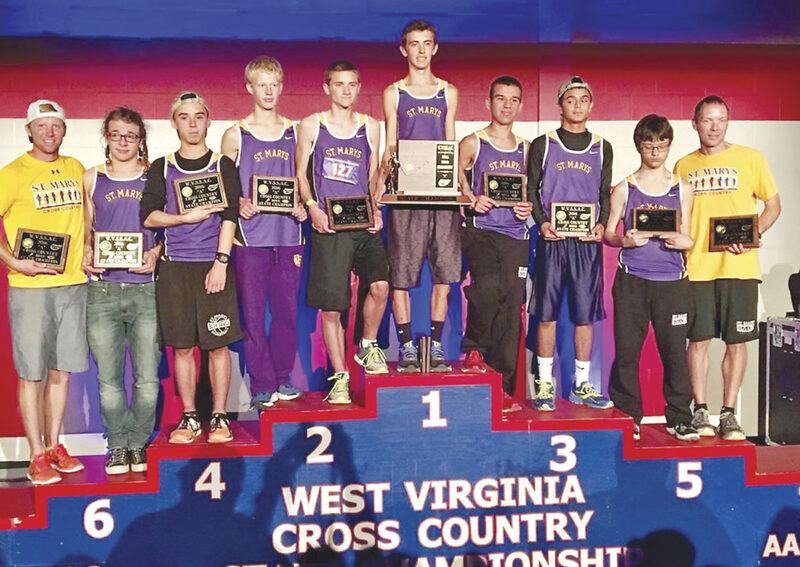 The St. Marys cross country team captured the first ever Class A title after competition was over Oct. 29 at Cabell Midland High School. The St. Marys football team celebrates after claiming the first football state title in school history. The Blue Devils finished off a 14-0 season with a 23-8 win over East Hardy Dec. 2 at Wheeling Island Stadium. Wirt County’s wrestling team celebrates after winning the first Class A state title in W.Va. history Feb. 24 in Huntington. Parkersburg Catholic boys’ tennis team ran away with the net crown May 12 at the Charleston YMCA. PARKERSBURG — Ravenswood baseball’s run to the Class A state championship game at the beginning of the month capped a remarkable sports year for the Little Kanawha Conference. The league made up of Class AA schools Roane, Clay and Braxton counties along with Class A programs Williamstown, St. Marys, Tyler Consolidated, Webster County, Gilmer County, Doddridge County, Wirt County, Calhoun County, Ritchie County, Parkersburg Catholic and the above-mentioned Red Devils laid claim to 34 state championships between team (6) and individual titles (in track, wrestling and tennis competitors are awarded a championship plaque in all events, while points go toward the overall team score for the squad trophy). Seven other groups took home the West Virginia Secondary School Activities Commission’s state runner-up trophy. Roane golf coach Jim Kendall began the conference’s year on a high note after he was named the 2016 National Federation of High School’s Coach of the Year. The Raider head man led the Class AA school to four straight state championships from 2013-16. Class A golf started a trend encompassing the competitiveness and outstanding play of the teams and individuals in the LKC throughout the 2016-17 season with multiple teams making state tournament appearances. Ravenswood and Gilmer County qualified their entire squad for an Oct. 3-4 trip to Wheeling’s Oglebay Resort. The Red Devils finished third, while the Titans experienced growing pains at the Jones Course. Wirt County’s Austin Stutler and Parkersburg Catholic’s Bryce Moore were the lone representatives for their respective teams. 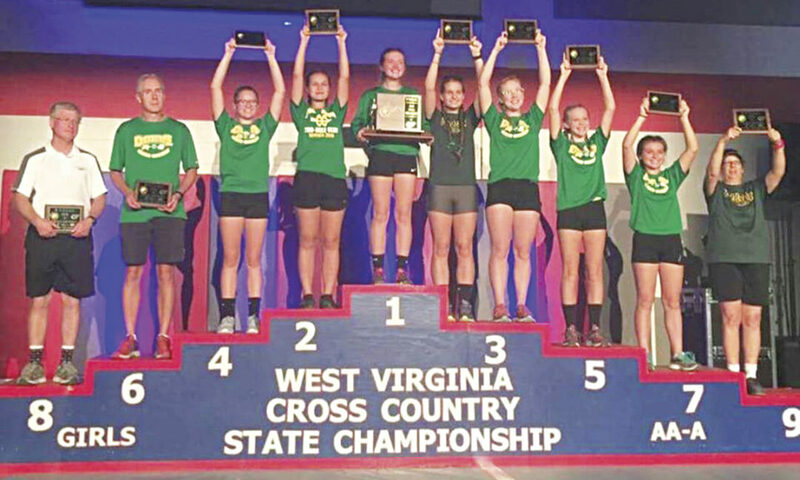 The St. Marys boys’ and Doddridge County girls’ cross country teams claimed the first two team state championships in historic fashion Oct. 29 at Cabell Midland High School. Blue Devil head man Steven Nutter and Bulldog coach Craig Kellar’s squads seized the moment and became the first Class A state title winners ever in the Mountain State. “We got to the (Pleasants) county line and six or seven cop cars took us into town and directed us into town and four or five fire trucks. The whole day, it was awesome and the whole day was just a blessing. The boys were happy and go lucky and didn’t look like there was much jitters. They just got it done and it’s special to be a part of for us,” said Nutter on returning home with a state title. Williamstown and Ravenswood sent several runners to the final meet of the year. Braxton County’s Seth Backus ran his way to the highest placement of any LKC competitor with a third-place time of 16 minutes and 26 seconds. Wirt County volleyball and head coach Janet Frazier were three separate match points in the fourth set away from taking the team title count to seven during their Nov. 12 showdown against East Hardy at the Charleston Civic Center. Looking for back-to-back state crowns, the Tigers couldn’t stop the Cougars from securing the first title in school history. The fact the conference didn’t walk away with the net crown is astonishing. Four different league teams were in attendance at the state tournament in Wirt County, Williamstown, Tyler Consolidated and Ritchie County. Fanatics of the Class A conference didn’t have to wait long for the next chance to procure a state title when five gridiron teams qualified for the state football playoffs in St. Marys, Williamstown, Gilmer County, Tyler Consolidated and Roane County (Class AA). Both the Silver Knights and Raiders were pitted against the top seed in their classes and only played one game. Gilmer County, making its first state playoff appearance in school history, made it to the second round before Mote’s Blue Devils ended their season. 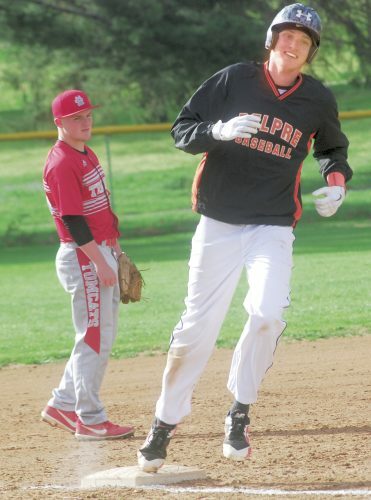 Williamstown fell to eventual state runner-up East Hardy in the second round. The only team left, St. Marys, capped off a perfect season with a 23-8 championship game win Dec. 3 at Wheeling Island Stadium. The Blue Devils ripped through the playoffs and other than a Buffalo touchdown in the opening-round, East Hardy running back Philip Mullin’s six-yard scoring run in the title game were the only points allowed by St. Marys’ defense. A conference team again reached the top of the W.Va. sports world roughly 80 days later. This time, Danny Life’s Wirt County wrestling team fought through a tough field Feb. 22-24 and emerged as the first-ever Class A state champions 55-45 over Magnolia. Mike Burns was the closest the Tigers had to an individual champion. He was defeated by 2017 Robert Dutton Award winner Noah Adams of Independence in the 220 lbs. championship finals. Calhoun County was the next highest team finisher with a fifth-place showing. Two weeks later, Class A girls basketball state tournament six-seed Williamstown began an impressive run to the state final March 7 inside the Charleston Civic Center. The Yellowjacket squad featuring six seniors captured wins over third-seeded Tucker County and second-seeded Wheeling Central to set up a matchup against 2016 state runner-up Huntington St. Joe. The Irish squeaked by Gilmer County in the first round, before blowing past their last three opponents for their ninth title in ten years. Seventh-seeded Ritchie County and head coach Dave McCullough missed a few opportunities in their opening round game against Central and were done after one game. One week later, Ravenswood boys basketball and head coach Mick Price fought their way to the Class A title game. However, a state championship was not in the cards for the Red Devils as Notre Dame took the gold hardware after a 63-55 decision. The Irish downed Gilmer County in the opening round of the tournament. 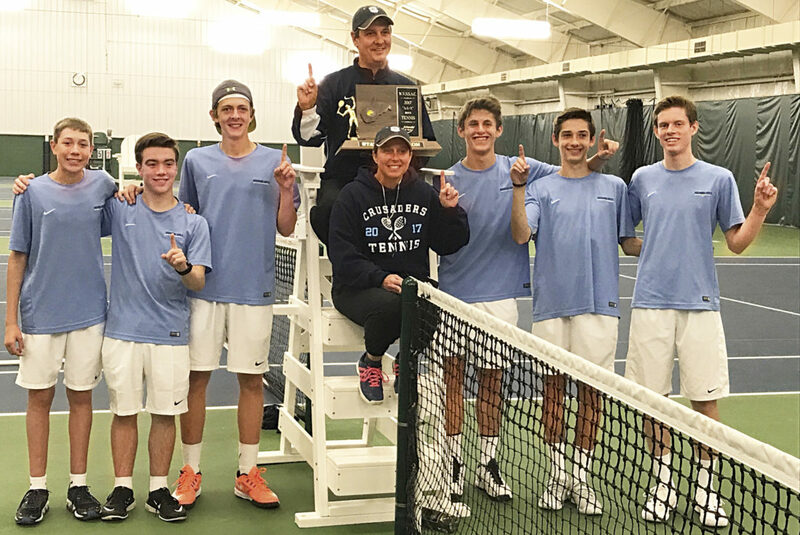 Parkersburg Catholic boys’ tennis wrapped up the fifth team title May 11 inside Charleston’s YMCA tennis facility before the championship round had begun. Furthermore, the Crusader boys under first-year head coach Jason Discini laid claim to all four singles titles. Discini’s daughter, Marie, capped off an undefeated season by winning gold in the No. 1 singles spot. She and Hannah Sprout also qualified for the state championship in No. 1 doubles. Sam Hilton’s Ravenswood boys’ squad took home a runner-up team finish, but didn’t leave the state capital without championship gold. The Red Devils’ No. 1 and No. 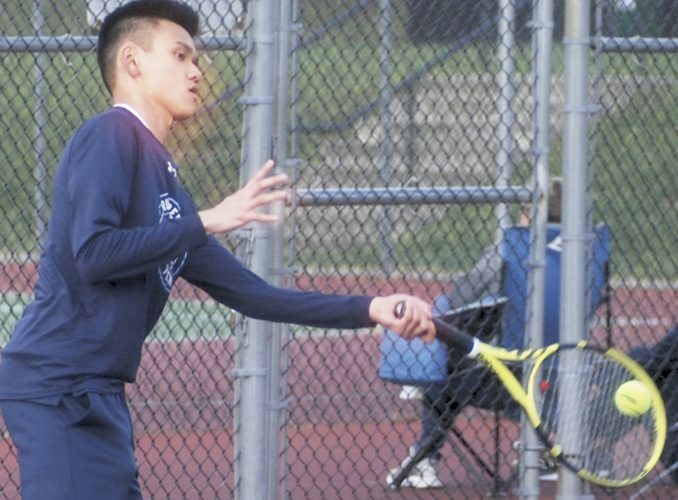 3 doubles teams finished the year with top-of-the-podium finishes. Williamstown girls’ No. 3 doubles team of Aaliyah Enoch and Susan Fauber battled their way to the state finals. 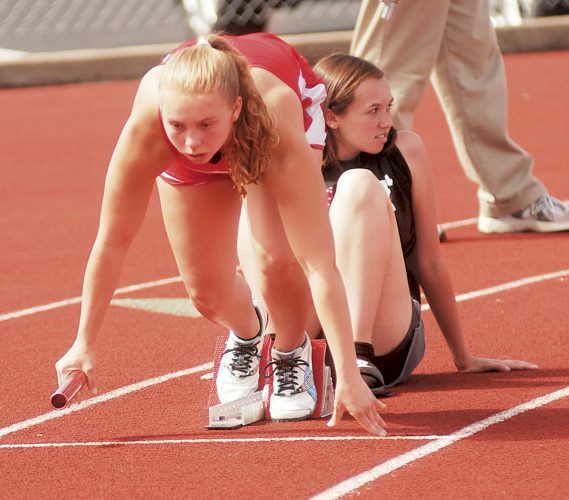 The competition for the Class A boys and girls track and field team top award came down to the final race of the event — the 4×400 — May 19 at Laidley Field in Charleston. St. Marys boys’ squad led rival Williamstown, 95-93, with no other team close to either school. The Blue Devil team finished thirty-two thousandths of a second from breaking the state record and won the event to hand the gold to their team. Meanwhile, Doddridge County girls finished two points out of Wheeling Central’s championship-winning 69 points. 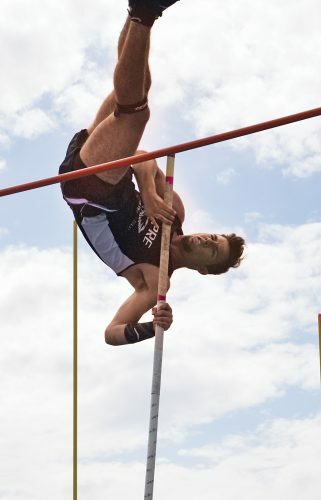 Individually, the conference claimed 21 titles across Class AA and Class A during the weekend. Team success doesn’t tell the whole story, however; while it is true there is no “I” in team there are athletes who shine a little brighter over the course of a grueling season. Recognizing those contributions are the annual all-state teams voted on by the West Virginia Sports Writers Association. The Little Kanawha Conference was not lacking in representation in those teams either. Upwards of 70 athletes were placed on the honor squads throughout the season with some making repeat visits over multiple sports. Softball, football, baseball and volleyball saw the highest number of players voted on to the first team. Nine made it on the gridiron squad, while five or more saw their names inserted onto the other lists. Four of those athletes were awarded the highest honor available to a first-team selection. Parkersburg Catholic’s Abby Witucky (volleyball), Williamstown’s Ashley Morris (girls basketball), St. Marys’ Will Billeter (football – defense), and Ravenswood’s Chase Swain (baseball) were honored as the captains of their squads. To top off the year, 500 people attended the Little Kanawha Conference dinner in Flatwoods in lieu of graduations and the WVSWA’s awards banquet in Clarksburg.